Farrell Promotions hosted its first show of the year as the crowd packed into the Village hotel to be thoroughly entertained. Dylan ‘Real Deal’ Moran opened the show as he dominated Kevin McCauley over 4 rounds to get the decision. As definite a star in the making as you can get the ex-world champion Kickboxer didn’t give an inch as he gave a thorough lesson to McCauley from the opening bell there was no let up as Moran boxed his opponent around the ring thudding in powerful shots that caused the crowd to cheer at every opportunity. There was no doubt in the result as both boxers embraced at the end of the fight with Dylan looking like he could have gone a few more rounds if required. The likeable Irishman looks to step it up throughout the year and will hopefully get the opportunity to show the rest of Britain what we in the North West already know. The battle of the 0’s was up next as Ricky Hatton fighter Jake Haigh squared up against Birmingham’s Jarrett Doherty, there was a notable height difference which greatly troubled Doherty in the first 2 rounds as he struggled to get inside the big Mancunians long rangy jab, the bout changed in the middle rounds as the Brummie man found his shots starting to hit the mark and started pushing the bigger man back, Haigh rallied again but Jarrett was relentless as the big man looked like tiring, with the crowd screaming his name Jake rose for the last round looking haggard, as the bell rang through his head lifted and he pushed forward with the jab and some wicked looking body shots. With every person on the edge of their seats both men pushed it to the limit and deserved the massive round of applause that followed the final bell. A hush descended as we awaited the decision as the fight could have gone either way but Haigh had his hand raised as he was declared the winner by a whole point. Doherty’s 0 may have gone but he can definitely come again and with any luck we’ll get a rematch of this further down the line. 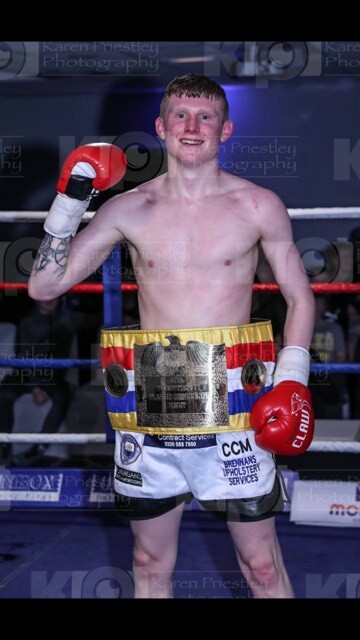 The British Challenge belt was up after the break as the crowd were introduced to Anthony Crolla and Ricky Hatton, both absolute gents and a credit to the sport and of course to the great City of Manchester. The crowd filtered back in after the break as ‘Cereal Killer’ George Brennan made his way to the ring to take on Feisty Brett Fidoe for the second time as their first bout ended in a draw. Fought over 10 rounds the start was slow as both men were cagey about committing themselves not allowing either to build up a lead. With instructions from Coach Kieran Farrell George started to take over in the middle rounds as he hit a number of combinations to body and head that Fidoe at first had no answer too, he settled quickly though and once again the bout started to go back and forth before disaster in the 6th as George was deducted a point for holding, a harsh decision that was not appreciated by the crowd as a chorus of boos reigned down on the referee. A rejuvenated Fidoe started to really push forward but could not find a way through Brenan’s defence as he settled into a counter puncher role the final 2 rounds were barn busters as both left caution in the ring and tried to stop each other. The crowd went silent again as the decision was prepared and mutterings were heard around the ring as time seemed to stretch on, finally we were ready and both men were sequestered in the middle of the ring, a cry went up as Brennan was announced the winner again by a single point, the frustrated Fidoe through his hands down in despair as the belt was handed to the younger man who proudly stood for pictures. A tight decision to be sure but the right man was declared the winner. Brennan looks to move up in weight in the near future and is ready to chase further titles. A break was definitely called for as we piled out for refreshments until the call came up that the main event was ready and we packed into the hall once again. ‘Kombat’ Lee Clayton entered to a raucous crowd as a moment that must have looked like it was never going to come (opponent Tommy Chadburn had pulled out due to injury, the 3rd time this had happened) was finally here. Lee’s stable mates took seats in the VIP and trainer/coach Nathan Farrell looked on from the side-lines. This was Lee’s time, since a shock knockout in the first half of 2016 Nay had taken over coaching the southpaw and a completely different Lee was about to emerge. His opponent Edward Bjorklund entered as the chants continued for the Heywood man but didn’t seem fazed as he took instructions from his coach, and then we’re ready. All eyes were on Lee as the bell went and we awaited him to do his usual of rushing at his opponent looking for the early knockout. Surprising to all (Other than his coaches, Nay in particular) Kombat took his time and started to slowly dismantle Björklund from long range at first moving in close each time he could. What followed next can only be described as a near perfect punch performance as Lee followed his coaches game plan to the letter, leaving the path rarely to involve himself in a couple of slugfests that saw Nay and the crowd shouting at him to get off the ropes (not that there was any danger as his defence was tighter than I am). There was to be no holding of breaths or worried looks as the final bell went and Lee was crowned a worthy International Champion beating Bjorklund in every round. A jubilant Clayton then ushered Nay into the ring to acknowledge the time he’d put in and allow them both to share in the glory of a truly epic win. All in all another brilliant night of boxing hosted by Farrell Promotions and another step on the ladder for all involved.